Did I get my bed bugs on Ebay? 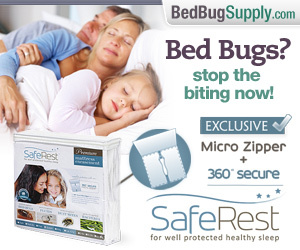 That’s the title of this article, written by someone who had bed bugs. She speculates that she may well have gotten them from eBay. Or from a roommate who is completely unaffected by the bugs, but who likes to travel. (Maybe he brought them home, but, unallergic, never noticed them). She also has an experience some Bedbuggers have shared here, seeing a neighbor obviously cleaning up their own infestation (never disclosed to the author). Though she does not suggest this, the bugs may well have come from the neighbor–perhaps this is the most likely scenario. 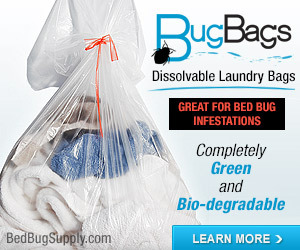 We often think we know where our bed bugs came from. Some, like this author, and our own Jess, speculate about the source. In Jess’s case, she later discovered she was wrong, but only after telling the world she got them from a friend’s secondhand mattress. The lesson is this: you think you know where you got them, but you don’t. Had she found out her mattress-giving-friend had bed bugs, Jess probably would have stayed with that explanation. Instead, other more likely scenarios came to light. People often say in the comments or on the forums, “I am going to sue my neighbor who gave them to me.” But you can be bitten for months with no reaction; you could have given them to the neighbor. Landlords, too, may blame new tenants for bringing them in, when all the while, the former tenants could have been infested and not even known about it. 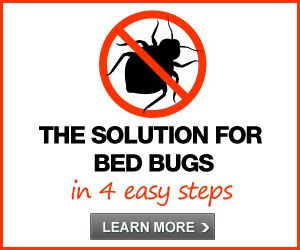 Tricky little b@#$%^&s, these bed bugs. I think Ms. Porter is a little confused about the thermal issue. One hundred forty degrees Celsius would be 284 degrees Fahrenheit which I agree will kill an unprotected bedbug within the fifteen minute time frame. Still, I think she might have meant to say 140 degrees Fahrenheit. I finally had to give up trying to figure it out. There were multiple causes at play, is my best guess. After that, I felt better … but still have my ideas. You can’t think sharp enough–or at least I could not until I just dealt with the bugs themselves and gave up or got over the blame. I’ve lost friends and stand to loose more all over blame. Doug–good catch. I did not even notice that. Willow–oh, sorry. 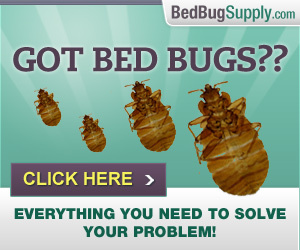 I KNOW where you got bed bugs. Your neighbors! That’s a no-brainer, Willow! 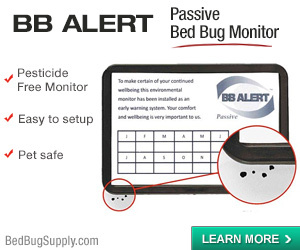 Are you suggesting that someone can live in an apartment unaware of the existence of bedbugs or are you suggesting that the person sees the bedbugs, but doesn’t realize what they are or do? Those are very different scenarios (albeit with the same result). Uhm, so how did Jess get bedbugs? Yes, James. 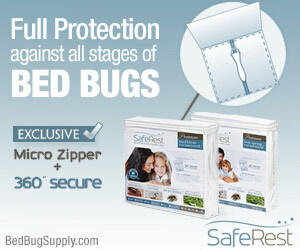 I believe people can live in an apartment unaware that they’re infested with bed bugs. We know that some people do not react to bites. Many of us here were bitten and did react, but saw few, if any, bed bugs. And most of us were looking for them. Had we been un-allergic, and not reacted to the bites, we may not have noticed we were infested until they were falling off the ceiling in front of our eyes, or scurrying across the walls in broad daylight: both signs of heavy infestations. 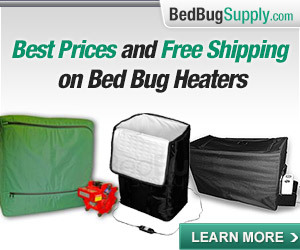 You’d be surprised how stealthy bed bugs can be. So the idea of a tenant suing another tenant for “giving them bed bugs,” or for a landlord suing a tenant for “bringing in bed bugs” is absurd in most cases, since in the first scenario, my neighbor could have given me bed bugs, I got them, was allergic, he finally saw tons of them, and maybe even started itching (after a long period of little or no reaction), and since I reported them first, I look like the source. In these scenarios, most people–the other tenant, the landlord, neighbors, are going to think they know what happened in what order. But they may be wrong. People have told me they were threatened with lawsuits under similar circumstances. The lawsuits would not hold up in court, but tenants have been blackmailed into paying for treatment of themselves and neighbors under these conditions, and some have later found evidence they were not responsible. It’s awful. It’s been my experience, and that of many others here, that for those really allergic to bed bugs, the bites come long before the sightings. Buggles- see my response to your comment about suing me. 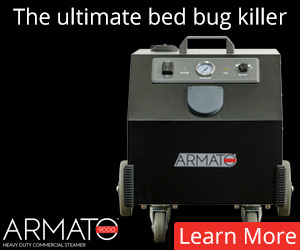 I do not know, and will never know, how I got bedbugs. I don’t want to belabor this point, but all multiparty tort litigation presents challenging causation issues. Read the nonfiction book A Civil Action for a good example of a challeging causation case. Bedbugs may prove even more challenging than toxic waste, but that’s no reason to dissuade people from seeking justice and compensatory damages. Maybe. But it would be wrongheaded in other ways, by providing a powerful disincentive to notify. Any single tenant’s failure to notify can have a direct impact on all tenants living in a multi-unit building. And consequently on all persons in that community who share public places, etc. 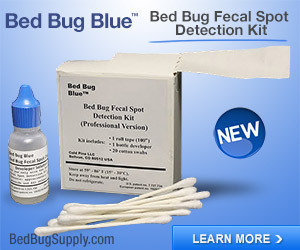 We need to get rid of all financial incentives to keep silent or lie about bedbug issues. I’m not sure that the lessons of A Civil Action enhance your argument. That trial is a study in failure of all kinds. Anyway, there are other interests at play here. 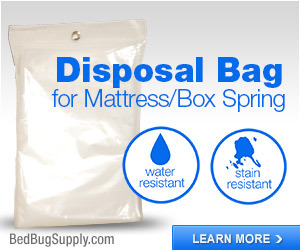 I could argue that we have a real interest in dissuading people from some types of bedbug litigation. PS for Nobugs: Robert Duvall as Mildred’s defense lawyer! Not speaking up about a problem you know about — that’s even worse than negligence. That’s reckless endangerment. 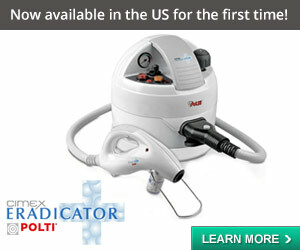 I don’t think lawsuits would have a chilling effect. I think lots of people have already chosen not to say anything. In fact, the kind of lawsuit we’ve been debating is one that would occur when the building is already well on its way to becoming infested — precisely because people didn’t say or do anything. The cat’s out of the bag at that point. I think Al Pacino is the right guy to take Mildred’s case — from And Justice For All. But who will play poor, hapless Mildred? I like Don Cheadle as the neighbor. It’s creative casting: we haven’t really seen him in a role like this–uber-confidence and a drive for revenge. Confidence which fades as he realizes his culpability, and how he pushed Mildred to the brink. Buggles, I thought the original debate began with the comment you made about suing me, which was based on what you read in my Craigslist post. If I’m wrong, I apologize, maybe I’m not following. If I’m right, though, I’d love to know who didn’t speak up about an infestation, and, more importantly, who was “recklessly endangering” someone else. Truth is, if you’re basing your argument on my case, then there’s lots more you should know before you make judgments. Frankly, your argument would be weakened considerably if you knew just how far I went (and how much money I spent) to protect my neighbors and landlords. I think you need to read the other thread (ABC7 Eyewitness News: in Recent Comments)–this conversation is spanning these two threads and it is probably confusing you. I think James is talking theoretically now, and basing it on a hypothetical scenario I drew up in a LONG comment on that other thread. You’ll see. (It’s the unwritten screenplay of said comment that we’re “casting” above.) Hope that helps clear things up and avoid any tensions. I will say this, though: I think James’s original comment (much earlier) about being your neighbor and suing you was based on the implication in the Craigslist post you wrote, that you got them from a used mattress. It’s my understanding that events came to light later that made that appear not to be the case, and you do NOT need to go into these if you do not want to, however, I think in his defense that James was just working with the analysis you’d provided in your Open Letter. (I used the used mattress scenario in my fictional scenario, soon to be a major motion picture.) Anyway, you’ll see. 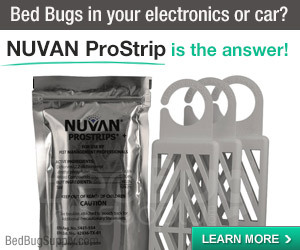 Thanks for the clarification, Nobugs. In any case, it is my opinion that the perpetuation of the blame game among bedbug victims is reprehensible, regardless of the basis of the argument. 1) Looky what else Donna Porter wrote about. Useful. 2) Nobugs, you are cheating, you have to say which Don Cheadle, the Traffic Don Cheadle? But I forgive you, for a) you are the brilliant writer and b) Don Cheadle! ok 4 things) I was shocked the first time I heard someone talk about suing whoever “gave them” bedbugs. I’m sadly more used to it now and I think, as one such person suggested, that they may be stuck in the “anger stage” of their bedbug grief, whatever that is. My hope is that the futility of such thoughts will become apparent to them at some point, hopefully before they try to engage a lawyer. In addition, my scenario on the ABC7 thread is trying to show that–beyond that–it also does not work. 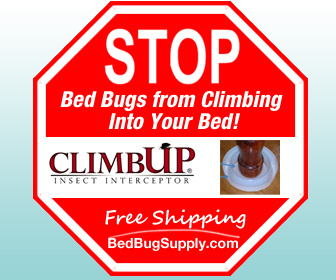 That discovering the truth of where one’s bed bugs came from is much more difficult than it might seem, and so people need to realize the pointlessness of it. There’s more than one Don Cheadle??? Joan Cusack is great, but it’s typecasting: she is always beleaguered. Still, this will get her away from being the sister-figure. As a leading lady, she will triumph. We’ll have to give her a love interest. Yes, making up the rules as you go along is not fair. 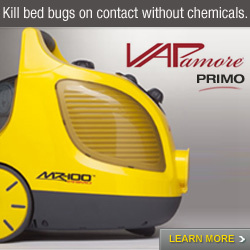 But this is a site about bedbugs. Fair is not a rule of the game. Aha! See, I did not get the game. I was playing “creative casting” which, because creative, does not work in the parameters of your game. I will defer to your greater knowledge of film, and accept the Traffic Don Cheadle. The love interest idea is promising. If this is going to be a Hollywood film, then Don Cheadle and Joan Cusack will have that typical charged moment that goes nowhere. But I want to play your game too, so I give you either the fantastic Kimberly Elise or the delicious Bette Midler as Mildred. Lily Tomlin can be Don Cheadle’s lawyer. And how about Jeff Goldblum as Rose’s husband. I love you guys! This is fantastic. Jess, you can play too. Your prize will be an executive producer credit. Lily Tomlin is a given. And Midler as Mildred is genius. Goldblum definitely needs a California King. But maybe friend Rose should change to cousin Ross: anyone got a casting idea for a not-so-tall male? How about John Turturro as the landlord (a nod to Willow), and (this is my dealbreaker:) I am writing in Winston O. Buggy as the persistent PCO, to be played by Tom Waits, who will also sing the theme song in a duet with Bette: the classic Mean Ol’ Bed Bug Blues. Lou Sorkin, expert witness, must play himself. Cousin Ross has to be the late Dudley Moore. I know, it’s not even my turn but I HAD to, Nobugs, I will now let others play, I promise. However, may I suggest the next phase of the game: location. Martin Scorsese’s New York, or Spike Lee’s New York, or Woody Allen’s Manhattan. Or the Chicago of Ferris Bueller’s Day Off. Or the Philadelphia of Trading Places. I am stumped on location: I’d do Spike Lee’s Bed-Stuy (of Do the Right Thing), but then the whole gentrification thing would take over the story, and Mildred would be the bad guy all over again. Excellent! But the judge is usually the dumping ground for talented minority actors with unjustifiably small roles. So you could make the judge really influential. Here are some other actors to consider for either that or the Hawaiian hotelier or, who are we missing? Sergi Lopez, Om Puri, Chiwetel Ejiofor, Allison Janney, Viola Davis…. This is making my week! Also, you need to name this great movie of the mind. Extra points if you come up with a title without the word bug in it!!? Also, Ross (or Russ, perhaps): since this movie is SO going to happen, can we replace Dudley Moore with someone who is not dead? I’m blaming Jess for encouraging us (let that be a lesson!) so she better come up with Mildred’s cousin/Jeff Goldblum’s boyfriend herself. But he can’t be tall! He has to be normal height or shorter– we must remember the California King. Wow, this really mushroomed! I continue to disagree with everyone here about bedbugs as a personal injury matter and investigating the source, but I’ll leave it there. Litigation is not enjoyable for any party so I don’t suggest it lightly. Back to the game, Kirstin Dunst for Mildred since she already has the right feet for the role. Danny DeVito as the landlord. Roy Scheider as the irascible judge who never made it to a higher court appointment. NoBugs in a small cameo role live blogging the trial. Finally, to further mix comments and posts, Donna Porter’s article is scary stuff. There’s a disconnect going on what with news reports that show a bedbug climbing up the wall in broad daylight versus Donna tearing apart her room before “lucking out” and finding one. 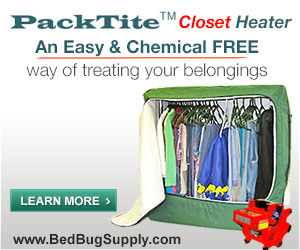 It makes me wonder if more people who have bedbugs don’t know it than do. Hi James. I hope now you are starting to see. Donna Porter tore her room apart because her skin was on fire. Those who are not reacting to the bites (although some may later react) have no such motivation and may not find them even during a thorough cleaning. They will only learn of the problem when they finally see them. (I think most people would then take steps, whether they react to the bites or not. Only a small number of people I think would shrug it off.) Because bedbugs readily spread, no accurate timeline of infestations can be ascertained, no matter how many tenants you depose. Further scary thought is this: if we can’t find them at home, what makes us think we can find them in an unfamiliar hotel room, where you can’t even move some things. I think Nobugs might like Dunst for Mildred, in which case I propose Simon Pegg (Hot Fuzz) for her cousin.